There has always been an outcry over some of the race horse industry practices. There have been a number of race horses who have broken down on the track. The most recent breakdown of the filly, Eight Belles, has brought this concern to the forefront of the news industry. Sound breeding practices, training methods, racing industry practices, medicines, etc. are being scrutinized more carefully. It has been noted that many of the horses who have broken down, for example, can show bloodlines tracing back to Native Dancer. The following is a list of the most famous racehorses who have broken down on the track along with biographies of each horse. Barbaro (April 29, 2003 - January 29, 2007) was an American thoroughbred that decisively won the 2006 Kentucky Derby but shattered his leg two weeks later, in the 2006 Preakness Stakes, ending his racing career and eventually leading to his death. 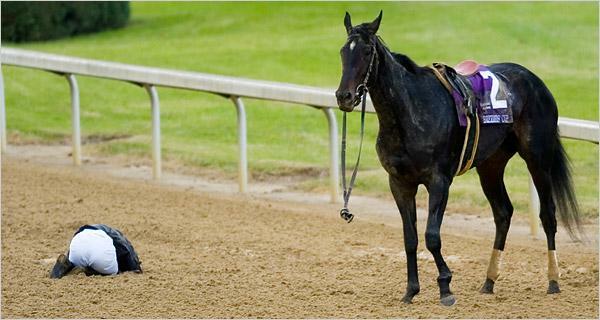 On May 20, 2006, Barbaro ran in the Preakness Stakes as a heavy favorite, but, after he false-started, he fractured three bones in and around the ankle of his right hind leg. The injury ruined any chance of a Triple Crown in 2006 and ended his racing career. The next day, he underwent surgery at the New Bolton Center at the University of Pennsylvania for his injuries. In July he developed laminitis in his left rear leg. He had an additional five surgeries, and his prognosis varied as he remained for an extraordinarily long period of time in the equine Intensive Care Unit. While his right leg eventually healed, a final risky surgery on it proved futile because the colt soon developed further laminitis in both front legs. His veterinarians and owners then concluded that he could not be saved, and Barbaro was euthanized on January 29, 2007. He is a third-generation descendant of Mr. Prospector, and as such Barbaro is related to many recent Triple Crown hopefuls including Big Brown, Eight Belles, Afleet Alex, Smarty Jones, Funny Cide and Fusaichi Pegasus. 2006 Kentucky Derby Winner's Sign at Churchill Downs - Going into the Kentucky Derby, Barbaro was undefeated. He was sent off as the second choice of the betting public, at odds of 6:1, in a full field of twenty horses. Barbaro charged ahead during the last turn and straightaway of the race to win by six and a half lengths. Barbaro's lead in the final furlong expanded, although jockey Edgar Prado did not use the whip and ask for his top speed. This margin of victory at the Kentucky Derby was the largest since 1946, when Triple Crown winner Assault took the "Run for the Roses" by eight lengths. 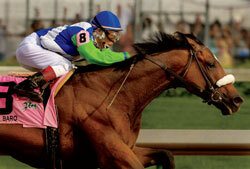 Barbaro's win made him only the sixth undefeated horse to win the Kentucky Derby. During the gallop-out after the wire, Barbaro's lead extended to 20 lengths, which is rare during post-race gallop-outs. Barbaro had also not raced for 5 weeks prior to the race, which was the longest layoff in 50 years for a Derby winner. Barbaro's Preakness Stakes began with a false start when he broke from the starting gate prematurely. Barbaro had used only his nose to disengage the magnetically locked gate bars, and was led back around the gates to be reloaded. Barbaro was deemed fit upon being reloaded into the gate. 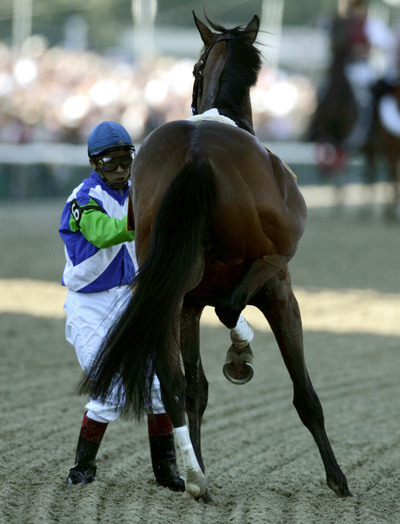 As the restarted race began, Barbaro broke cleanly, but would soon suffer the catastrophic injury as the horses passed by the grandstand shortly after the start. Many theories as to the cause of the accident have been offered, though none have been confirmed. Barbaro broke his right hind leg in more than 20 places: a broken cannon bone above the ankle, a broken sesamoid bone behind the ankle and a broken long pastern bone below the ankle. The fetlock joint was dislocated, and his foot was left dangling loosely. Veteran jockey Edgar Prado immediately pulled Barbaro up, and brought him to a gentle stop. He dismounted and leaned his shoulder into the horse's shoulder to support Barbaro until track attendants could arrive. Bernardini went on to win the race. Barbaro's injuries were life-threatening, partially because a thoroughbred's breeding optimizes its anatomy for speed rather than durability. Unlike other mammals, such as dogs, a horse cannot survive in humane circumstances on three legs. A single broken leg in a horse can lead to complications as the other legs attempt to bear the weight of the horse's body. Barbaro was taken to the University of Pennsylvania's New Bolton Center in Kennett Square, Pennsylvania for treatment. The center is renowned for its specialized care, especially for animals needing complicated bone surgery. Dr. Dean Richardson was assigned as Barbaro's primary veterinarian. The day after the race, Richardson performed a fusion of the fetlock and pastern joints to stabilize it and make it strong enough for Barbaro to walk on. It was a five hour procedure and was one of the toughest surgeries he had ever performed. The surgical team successfully implanted a Synthes stainless steel Locking Compression Plate and 27 screws into the colt's injured leg to span the comminuted fracture and joints. They used the LCP because its screws thread into the plate to provide maximum strength. Richardson is one of the first equine surgeons to implement this new technology, originally designed for humans. A fiberglass cast was placed over this to further protect the construct. Barbaro then went in the recovery pool at 7:40 pm. After about an hour in the pool, at around 9:00 p.m. EDT, Barbaro began to calmly awake from the anesthesia, stood and practically jogged to his stall. He then ate and was comfortably putting weight on the injured leg. The blood supply to the injury site was very good, but Richardson still gave Barbaro a 50-50 chance of survival. The next morning Barbaro was already showing interest in some of the mares at the facility. He was walking well on his limb, walking around the stall, he was quite active for his condition; in short, his first week of recovery went well. The cast was replaced on June 13, and again on July 3. In the first week of July, complications arose, and Barbaro had problems with both hind legs. He developed an abscess on his uninjured left foot, which was treated topically, but he carried a fever through the weekend and failed to put weight on his injured right foot for any significant length of time. By July 13, Barbaro had developed a severe case of laminitis in the left hind hoof, a potentially life-threatening affliction that is common in horses who shift weight to one foot for extended periods of time to keep pressure off an injured foot (in Barbaro's case, the right ankle he broke in the Preakness). A procedure called a hoof wall resection removed 80% of Barbaro's left rear hoof. The remaining 20% of his hoof wall was still attached to the coffin bone and was still living tissue, but it was unclear how much of it would ever grow back. Both rear legs were in casts. Richardson stated that his plans were to restrict himself to aggressive but standard treatments and that he would use no experimental procedures. Barbaro was given a special support boot for his laminitic hoof and placed on painkillers; a support sling was brought into his stall to allow him to take the weight off his hooves for hours at a time. On August 8, Barbaro's broken right leg had fused to the point where they would have replaced the cast with a brace if his left leg were sound. The coronary band on his left leg (the place from which the hoof grows) appeared healthy and all signs were encouraging. On the 15th it was reported that Barbaro had been allowed to graze outside for the first time since his accident. Two days later, Barbaro was no longer using the sling to support his weight, and so its use was discontinued. [ The next day, August 18, radiographs showed that his fractured right leg was almost completely fused. By September 26, it was decided that Barbaro's cast would not be replaced as long as he was comfortable in it. His left hind hoof had regrown about 18 millimeters and the support shoe had been replaced with a bandage. The hoof would have to grow to at least three times that length and that could take more than six months. On October 10, Barbaro's cast and protective shoe were changed. His left rear hoof was gradually improving from laminitis. There was good growth along the quarters (closer to the heel) but there would need to be much more healing along the front of the hoof, which would require many months. Barbaro reached another milestone on November 6, 2006 when his cast was removed for good and replaced with a splinted bandage. Barbaro's laminitic showed no new problems, but several months of growth would have been necessary before it could be further diagnosed. About December 12, Barbaro's bandage on his right hind leg was removed completely. This was announced during a press conference on Wednesday, December 13. Early in January 2007, the laminitic left hoof became the source of more complications. On January 10, another section of the hoof had been surgically removed. Updates over the next few days revealed that the cast had been reapplied to Barbaro's right hind leg for support, and that aggressive pain management and the support sling had been resumed. Nevertheless, Barbaro's condition was better than it had been the previous July. In another setback, Barbaro developed a deep abscess in his right hind foot. This is generally caused by lack of grip exercise. Additional surgery was performed on January 27 to insert two steel pins into the healed bones of Barbaro's right foot as part of an external skeletal fixation device. This would allow the right foot to bear more weight, but the procedure was risky, with the major danger being that the bones might break again. Later that same weekend, Barbaro's front legs, which had remained healthy throughout the ordeal, displayed clear signs of laminitis; Barbaro could not then comfortably put his weight on any of his legs. The laminitis that attacked his front legs developed as a result of not being able to bear weight on his hind legs. Barbaro was euthanized on January 29, 2007 around 10:30 A.M. EST by decision of his owners Roy and Gretchen Jackson, who indicated that they felt that his pain was no longer manageable. For his efforts to save Barbaro, the Turf Publicists of America voted Richardson their 2006 Big Sport of Turfdom Award. Barbaro was cremated shortly after he was euthanized. On January 29, 2008 it was announced that his remains would be interred in front of an entrance to Churchill Downs, and that a bronze statue of Barbaro would be placed atop his remains. The Jacksons chose to place his remains outside of both Churchill Downs and the adjacent Kentucky Derby Museum to allow his many admirers to pay their respects without having to pay an admission fee. Gulfstream Park established scholarships to the University of Florida with an initial total funding of $30,000 for two fourth-year students in Veterinary Medicine and one graduate student in equine veterinary research. Barbaro also inspired a large anonymous donation to the New Bolton Center establishing the Barbaro Fund, to aid the treatment and care of large animals. In 2006 a Limited Edition Ty Beanie Babies Barbaro Beanie was released. The plushie is 7" tall, 8" long and wearing his No. 8 on pink saddle cloth. In 2007, Breyer Horse Modeling Company released a Barbaro model that includes a Certificate of Authenticity from his owners, jockey, and main doctor at New Bolton. A following grew up around Barbaro after his breakdown in the Preakness. He became the object of care and affection from the public in a way only a few animals before him have. His stall at New Bolton was decorated with many thousands of Get Well cards (including a 7 ft by 72 ft card from fans at the Belmont Stakes), flowers and presents sent in by fans. Others sent in items meant to help him recover, such as saint medallions and holy water. His condition was followed by news organizations on a daily basis. During most of Barbaro's attempted recovery and after his death, there were some statements in the media who felt that Barbaro did not deserve the amount of attention that he was receiving from his supporters and the media. Deadspin, an online sports blog, was particularly satirical towards Barbaro's supporters; visitors to the University of Pennsylvania's Barbaro Message Board were mocked by Deadspin posters and staff. Others had previously suggested that, aside from the economic incentives, Barbaro had demonstrated a disposition that might enable him to survive and hopefully become a stud. Time magazine commented that despite the difficulties, Barbaro's fight was inspiring and that the hope for a near-miracle was not worthless. Ruffian (April 17, 1972 - July 7, 1975) was an American champion thoroughbred racehorse, considered to be one of the greatest female racehorses of all time. A dark bay, almost coal black filly, Ruffian was foaled at Claiborne Farm, near Paris, Kentucky. She was bred by Stuart S. Janney, Jr. and Barbara Phipps Janney, owners of Locust Hill Farm in Glyndon, Maryland. Ruffian was sired by the Phipps family's Bold Ruler stallion, Reviewer, and out of the Native Dancer mare Shenanigans. As a yearling and 2-year old, Ruffian was trained by Frank Y. Whiteley, Jr..
She earned the nickname "Queen of the Fillies" after being voted the Eclipse Award for Outstanding Two-Year-Old Filly in 1974 and winning the Filly Triple Crown (now called the Triple Tiara) in 1975. Lucien Laurin, Secretariat's trainer, even remarked to the press once that "she may be even better than Secretariat." Ruffian was undefeated in her first ten races, covering distances from 5.5 furlongs (1.1 km) to 1.5 miles (2.4 km) with an average winning margin of 8 1/3 lengths. She won her maiden race in record time and by 15 lengths. Her 11th and final race, run at Belmont Park on July 6, 1975, was a match race between Ruffian and that year's Kentucky Derby winner, Foolish Pleasure. The two horses shared the same jockey, Jacinto Vasquez. Vasquez chose to ride Ruffian in the match race, believing her to be the better of the two horses. The "equine battle of the sexes" was heavily anticipated and attended by more than 50,000 spectators, with an estimated television audience of 18 million. Just as the starting bell sounded and the race began, Ruffian hit her shoulder extremely hard on the starting gate. She recovered quickly, but was obviously in pain and leaning more heavily on her right foreleg compensating for the pain. The first quarter-mile (402 m) was run in a blazing 22 1/5 seconds, with Ruffian ahead by a nose. Little more than a 1 furlong (201 m) later, Ruffian was in front by half a length when both sesamoid bones in her right foreleg snapped. Vasquez tried to pull her up, but the filly wouldn't stop. She kept on running, pulverizing her sesamoids, ripping the skin of her fetlock as the bones burst through, driving the open wound into the sting sand of the Belmont track, tearing her ligaments, until her hoof was flopping uselessly, bent up like the tip of a ski. She was known for her incredible love of running and unwillingness to lose. She had never before been behind in a race. She was immediately attended to by a team of four veterinarians and an orthopedic surgeon, and underwent an emergency operation lasting 3 hours. Tragically, when the anesthesia wore off after the surgery, she thrashed about wildly on the floor of a padded recovery stall as if still running in the race. Despite the efforts of numerous attendants, she began spinning in circles on the floor. As she flailed about with her legs, she repeatedly knocked the heavy plaster cast against her own elbow until the elbow, too, was smashed to bits. The cast slipped, and as it became dislodged it ripped open her foreleg all over again, undoing what good, if any, the surgery had done. The medical team, knowing that she would probably not survive more extensive surgery for the repair of her leg and elbow, euthanized her shortly afterwards. Her performance in the 1975 season earned her the Eclipse Award for Outstanding Three-Year-Old Filly. In 1976, she was inducted into the National Museum of Racing and Hall of Fame. No match race has taken place at Belmont since Ruffian's death. Her breakdown and tragic death led to a public outcry for more humane treatment of racehorses. As it is natural for horses to thrash and kick when coming out of anesthesia, a "recovery pool" was developed so that they awake suspended in warm water and don't re-injure themselves. Medications such as Lasix for bleeding and corticosteroids for inflammation and pain management, came into common use. While helping the horses in the short term, the increased use of medications at the track had a downside, as many more horses were raced while injured. It can be argued that thoroughbreds have become more delicate as a result of inbreeding, starting racing too young, and racing while injured; racehorses today run only half as many starts before retirement as did their counterparts 50 years ago. Some of this effect is likely also due to breeding practices that select for horses likely to have short, brilliant careers-like Ruffian's-instead of the traditional racing career which might have lasted several years. Indeed, Ruffian's bloodline may be considered at least partly to blame for her broken leg; her sire, Reviewer, suffered three breakdowns. Regardless, Ruffian herself may be regarded as one of racing's best and brightest. The Blood-Horse ranked Ruffian 35th in its list of the top 100 U.S. thoroughbred champions of the 20th Century. Sports Illustrated included her as the only non-human on their list of the top 100 female athletes of the century, ranking her 53rd. Ruffian is buried near a flag pole in the infield of Belmont Park. When she was alive, her trainer always put her in one of his old blankets, but when she was buried, he buried her in two of his good blankets, because she deserved them. She was buried facing toward the finish line. Go For Wand (April 6, 1987 - October 27, 1990) was a champion American thoroughbred racehorse. Sired by Canadian Hall of Famer Deputy Minister, Go For Wand was foaled and raised at Christiana Stables. She was a rising star of racehorses, particularly fillies. As a two-year-old, she had a record of three-for-four before winning the 1989 Breeders' Cup Juvenile Fillies. Her performances earned her the 1989 Eclipse Award for Outstanding Two-Year-Old Filly. As a three-year-old she was seven-for-nine and voted the 1990 Eclipse Award for Outstanding Three-Year-Old Filly. In a highly anticipated match against the Argentinean mare Bayakoa, she broke down in the 1990 Breeders' Cup Distaff at the sixteenth pole, shattering her right ankle. She fell to the track and threw jockey Randy Romero before rising to finish the race. Track personnel were able to get her back down and she was euthanized on the track. The next day, she was buried in the infield at Saratoga. The tragedy unfolded on NBC on live television, and painfully reminded viewers of Ruffian, another promising filly who was fatally injured on the track. In 1992, the Maskette Stakes, a Grade 1 handicap race for fillies and mares, was renamed the "Go For Wand Handicap" in her memory. She is listed as #72 by Blood Horse on their list of top 100 U.S. thoroughbred champions of the 20th Century and in 1996 was inducted into the National Museum of Racing and Hall of Fame. Charismatic (karizumatikku; b. 1996) is a stallion Thoroughbred horse, and is known as one of the closest challengers to the Triple Crown of Thoroughbred Racing since the last winner, Affirmed, accomplished the feat in 1978. He was trained by D. Wayne Lukas, and famously ridden in the Triple Crown races by Chris Antley. Today, he stands at stud at Iburi Stallion Station in Japan, operated by the Japan Bloodhorse Breeders Association. His sire was Summer Squall, making him a third-generation descendant of Secretariat via Weekend Surprise, and his broodmare was Bali Babe. His succession from Weekend Surprise gives him blood relation to A.P. Indy. Charismatic began his career on a downhill stretch. He was placed in claiming races by his owner, Bob Lewis, twice, for the last time on February 11, 1999. He was a 31-1 longshot in the 125th Kentucky Derby on May 1, 1999, but won the race with a time of 2:01.20 around the 1 1/4 mile track. Charismatic finished by a head in front of Menifee, giving Menifee's trainer Elliott Walden his second Kentucky Derby place showing in only his second entry. Cat Thief, also trained by Lukas, was third. The win denied Lukas' rival trainer Bob Baffert of his third straight Derby victory. His three entered horses, two of which were co-favorites at 9-2 odds, failed to make the top three. Charismatic also won the 124th Preakness Stakes on May 15 with a time of 1:55.20 around the 1 3/16 mile track. He was 1 1/2 lengths ahead of Menifee, again second, with Badge finishing third. Despite the Kentucky Derby win, Charismatic was still not the favorite to win, posting 8-1 odds. Menifee was actually the favorite at 5-2. At the 131st Belmont Stakes on June 5, however, Charismatic was a 2-1 favorite, with Menifee second in odds at 7-2. The rivalry between Charismatic and Menifee was compared to Affirmed and Alydar in 1978. Charismatic looked like he would become the first horse in 21 years to win the Triple Crown, taking the lead in the final furlong. However, the horse faded, and lost the lead to eventual winner Lemon Drop Kid with 1/8 mile to go, ultimately finishing third behind second-place Vision and Verse. Sensing something wrong, Chris Antley dramatically jumped off Charismatic and held up the colt's left front leg. Indeed it was broken in two places. Many say Antley's actions saved Charismatic's life, and the horse underwent career-ending surgery the following morning. 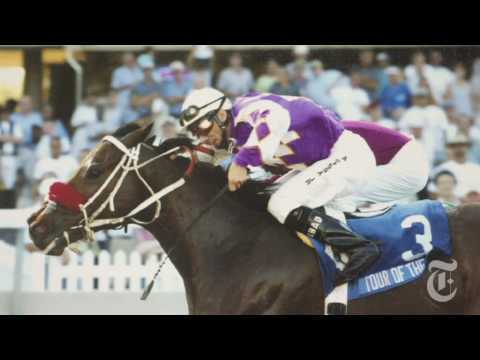 The moment was selected by racing fans as the 1999 National Thoroughbred Racing Association Moment of the Year. Charismatic finished his career with 5 wins, 2 places and 4 shows in 17 career starts, for total earnings of $2,038,064. 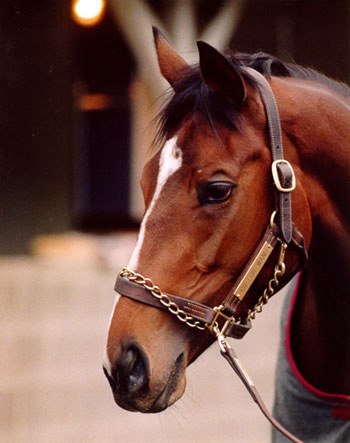 He won the Eclipse Awards for 3-year-old Colt of the Year and Overall Horse of the Year for 1999. In 2002, Charismatic was shipped to Japan to stand at stud. His current fee is about $7,000 for live cover. Landseer (February 28, 1999 - October 26, 2002) was a Thoroughbred racehorse. A son of Champion sire Danehill, he was out of the mare, Sabria, whose sire Miswaki was the sire of the great filly Urban Sea. Owned and raced by Michael Tabor & Sue Magnier, the colt was conditioned by the legendary Irish trainer, Aidan O'Brien. Sent to the track at age two, in June of 2001 Jamie Spencer rode Landseer to victory in the then Group III Coventry Stakes. The colt's other notable results that year came in October when he ran second to stable mate Rock of Gibraltar in England's Dewhurst Stakes at Newmarket Racecourse. He finished second again under jockey Michael Kinane in the Criterium International at Saint-Cloud Racecourse in France. As a three-year-old, Landseer finished third in April's Prix de Fontainebleau at Longchamp Racecourse in Paris then won the May running of the Group One Poule d'Essai des Poulains. In June, he had another second-place finish to Rock of Gibraltar, this time in the St. James's Palace Stakes at Ascot Racecourse in England. Landseer's next success came in October when he made his first start in the United States. Ridden by Edgar Prado, he defeated what Thoroughbred Times described as a "quality-laden field" in capturing the Grade I Shadwell Turf Mile Stakes at Keeneland Race Course in Kentucky. Because of his strong winning performance in the Shadwell Turf Mile Stakes, Landseer was then sent to Arlington Park in Chicago where he was entered as a supplemental nominee in the Breeders' Cup Mile. Once again Landseer would compete against nemesis Rock of Gibraltar, the overwhelming betting favorite. Racing in the middle of a fourteen-horse field for the first half mile, jockey Edgar Prado made a move with Landseer but at the top of the stretch the colt went down. His injuries were such that he had to be euthanized. Rock of Gibraltar, who started poorly and was far back most of the way, had to swing around the fallen Landseer but made a powerful stretch run to finish second behind longshot winner, Domedriver. 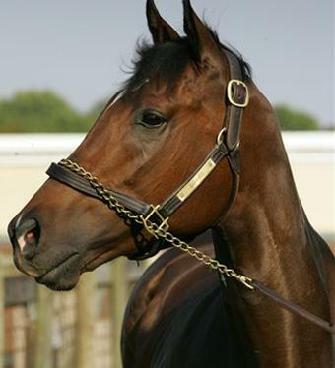 George Washington (January 3, 2003 - October 27, 2007) was a thoroughbred racehorse foaled in Ireland by champion sire Danehill out of Bordighera, also the dam of the high class colt Grandera. Bred by Roy and Gretchen Jackson, he was trained at Ballydoyle by Aidan O'Brien and owned by Susan Magnier, Michael Tabor, Derrick Smith. George Washington suffered a dislocated ankle fracture during the Breeders' Cup Classic at Monmouth Park on October 27, 2007 and was euthanized. 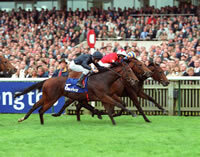 George Washington's debut was in a maiden race during the 2,000 Guineas meeting at Newmarket on May 1, 2005. This ended in defeat, finishing third behind League Champion over 5 furlongs (1,006 m). Victory followed in his second race at the Curragh three weeks later, this time over 6 furlongs (1207 m). Another win came in the Group II Railway Stakes, again over 6 furlongs (1207 m) at the Curragh. The Group I Phoenix Stakes was next on the agenda, and George Washington won by 8 lengths from his stable mate Amadeus Mozart, despite having been slightly hampered at the start. His final race as a two-year-old was in the National Stakes in September, another Group 1, and although victorious he failed to impress many, winning by just 2 lengths as a long odds-on favorite. Although he was declared to run in the Dewhurst Stakes the following month, he was withdrawn just minutes before the race after the ground was deemed unsuitable. For his performances, George Washington was voted the 2005 Cartier Award for Two-Year-Old European Champion Colt. The 2,000 Guineas at Newmarket was his first outing of the season. 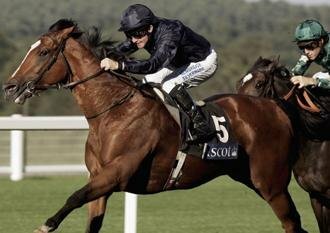 Aidan O'Brien was attempting to win the race for a fourth time, having previously won with King of Kings in 1998, Rock of Gibraltar in 2002, and Footsteps in the sand in 2005. "George" started as 6/4 favorite and won the race impressively, beating subsequent Epsom Derby winner Sir Percy by 2 George1/2 lengths. Disappointment followed in his next race, the Irish 2,000 Guineas, where he finished second, beaten 2 lengths by subsequent dual-Group 1 winner Araafa, who had been fourth at Newmarket. George's trademark finishing acceleration was blunted by the heavy ground conditions, and following the race it emerged that he had torn his foreleg muscles, accounting for his loss. 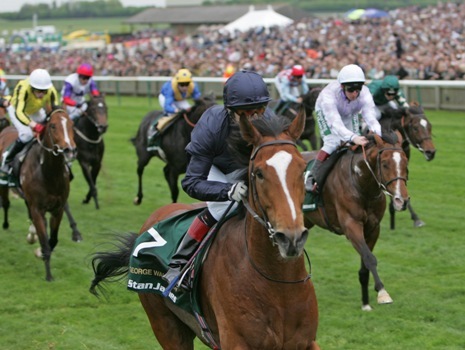 Due to the 2,000 Guineas form holding up, "George's" rating has been lifted, and his performance in the 2,000 Guineas officially remained the 2nd best performance by a 3-year-old in the 2006 season, beaten only by his own win in the Queen Elizabeth II Stakes at Ascot. "George's" comeback in the Celebration Mile was a somewhat disappointing one, finishing 3rd behind Caradak and Killybegs, but he missed the break badly under new jockey Michael Kinane, starting some 8 lengths behind the eventual winner Caradak, and finishing only 1 length behind him at the finish. The day before his main seasonal target, the Queen Elizabeth II Stakes, heavy rain arrived and 14 mm of rain fell on Ascot racecourse. He was very easy to back (or saddle), and his place as favorite seemed somewhat uneasy. However, half an hour before the race, lots of money came in for him to cement his place as favorite, and was sent off at odds of 13/8. Two pacemakers were deployed by Ballydoyle, and an incident occurred during the race between one of them the Seamus Heffernen ridden colt Hurricane Cat and Frankie Dettori's mount Librettist. "George" was travelling very easily throughout the race, and jockey Michael Kinane didn't even have to ask him a question, scoring easily by a length and a quarter. A tilt at the Breeders' Cup Classic at Churchill Downs had been decided upon about 2 weeks before the world famous event. A dominant miler, a victory in the Breeders' Cup Mile would do very little for his stud fee. Despite being by a predominantly-turf sire Danehill, his dam is Bordighera, who also foaled Grandera, a victor of a Group 2 on dirt in Dubai. Kinane was declared to ride, provoking memories of the infamous dropping of the reins on Giant's Causeway at Churchill Downs in the millennium year. "George" travelled brilliantly throughout the race, cruising up just behind the leaders before the final turn. He came wide to make his challenge, but was bumped by the eventual winner Invasor and lost momentum. Kinane reported that his stamina simply ran out, but the fact that he travelled so well on dirt was thought to boost his stud fee and also attract support from American breeders. Despite calls from jockey Mick Kinane and various members of the press for "George" to stay in training, he was officially retired and was due to stand at Coolmore's Ireland base for a fee of €60,000. On March 10, 2007 it was reported that Coolmore had suspended George Washington's stud career due to fertility problems. The decision was taken to replace him at stud with Holy Roman Emperor, a three-year-old colt who was being prepared to run in the 2,000 Guineas. Like George Washington, Holy Roman Emperor was sired by Danehill, and was also trained by Aidan O'Brien. He had been a leading two-year-old in 2006 and was second favorite for the Guineas before the surprise announcement of his retirement. 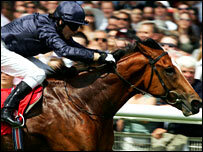 On March 25, 2007 it was announced that George Washington had returned to training at Aidan O'Brien's stable. He was initially entered for the Tattersalls Gold Cup in May but his return to the racecourse eventually came in the Queen Anne Stakes at the Royal Ascot meeting at Ascot Racecourse on June 19. He pulled hard going to the start in the early part of the race but eventually settled to finish in a close and fast-finishing fourth place behind Ramonti. His second race of 2007 came in the Eclipse Stakes at Sandown Park on July 7th. He finished third, one and a half lengths and a head behind Notnowcato and the Epsom Derby winner Authorized. Authorized and George Washington raced with the majority of the field up the far rail and Authorized won that race by a head; Notnowcato raced alone up the stands rail in search of better ground and beat them both. Kieran Fallon was then reunited with George in the Group 1 Prix Du Moulin in September. The partnership proceeded to finish a fast finishing third to the high class filly Darjina and top class Godolphin horse Ramonti. Many observers felt that George had been left with too much to do flashing home off a slow pace having been up to eight lengths off the enterprisingly ridden winner at the two furlong (400m) pole. George Washington was euthanized on the track following an open fracture to the cannon bone and both sesamoid bones in the right front fetlock while running in the Breeders Cup Classic at Monmouth Park on October 27, 2007, over a very muddy or "sloppy" track. According to Dr. C. Wayne McIlwraith, the on-call veterinarian, George Washington had cut off all blood supply to his ankle but was quoted that no studies had been performed regarding a relationship between injuries and sloppy tracks. All other races that day were incident free. Having been pulled up when well held at the sixteenth pole, George Washington was then euthanized on the track at the request of trainer Aidan O'Brien. It was only his second start on dirt and his only start on a sloppy track. The demise of George Washington overshadowed an excellent display from the three year old champion Curlin and led for calls for the end off traditional dirt tracks and the introduction of synthetic surfaces in their place. Only foal sired by George Washington: A George Washington filly, born at the Irish National Stud Feb. 4 2008. 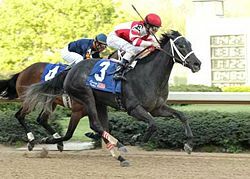 Eight Belles (February 23, 2005 - May 3, 2008) was a gray filly thoroughbred racehorse owned by Rick Porter's Fox Hill Farms. She finished second to winner Big Brown in the 134th running of the Kentucky Derby held at Churchill Downs, a race run by only thirty-nine fillies in the past. Her collapse just after the Derby's conclusion resulted in immediate euthanasia. Earlier in the year, Eight Belles made history at Oaklawn Park in Hot Springs, Arkansas, by being the first filly in the history of the track to win the Martha Washington Stakes (February 17, 2008, by 13 1/2 lengths, setting a stakes record for margin of victory), the Honeybee Stakes (March 16, 2008, beating unbeaten stakes winner Pure Clan), and the Fantasy Stakes (April 12, 2008, which she won in an exciting finish). Eight Belles collapsed during her cool-down immediately after passing the winning post. She suffered compound fractures of both front ankles and was euthanized on the spot because of the nature of her injuries. Dr. Larry Bramlage, the on-call veterinarian, stated that Eight Belles' trauma was too severe to even attempt to move her off the track. According to the Louisville Courier-Journal, Bramlage said the filly had fractures of the cannon and sesamoid bones in both front legs. That is the same type of break that was suffered by 2006 Kentucky Derby winner Barbaro in one leg. Eight Belles is scheduled to be buried at Churchill Downs' Kentucky Derby Museum, and a race has been renamed in her honor, and will run on Derby Day 2009. The National Thoroughbred Racing Association (NTRA) asked jockeys riding at Pimlico Race Course during all races over the weekend of the 133rd running of the Preakness Stakes (May 16th and 17th, 2008) to wear stickers on their boots or mud pants in honor of Eight Belles. The red and white stickers, made by the NTRA, had a bell, the number 8 and the word "Belles" on them. The Jockey's Guild wholeheartedly agreed. Jockey John Velazquez said: "It's something to remind everybody of a great horse. What happened was a really sad thing, and we're sad. I think it (wearing the stickers) is a good thing to bring awareness to our game. We'll do whatever is possible to minimize anything that happens like that." Kentucky chief veterinarian Lafe Nichols performed a necropsy and tests at the University of Kentucky's Livestock Disease Diagnostic Center. According to a review of the results by the Associated Press, compound fractures of both front legs at the fetlock joints were confirmed. They described lacerated skin on both legs, an absence of joint fluid in the damaged areas and congested lungs. The filly also experienced a bruised head and hemorrhaging in the left thyroid gland, which the report blamed on her fall after the initial injuries. Larry Jones, her trainer, commented that he believes the horse just tripped over her own feet. "She's bad about stumbling while pulling up. She doesn't pick her feet up very high. It's one reason she could run very fast and far. She had the perfect motion for being effective and efficient. However, those horses who do that have a tendency to want to stumble." The Jockey Club has formed a panel to examine the issues, which include breeding practices, track surfaces and medication. Veteran Washington Post sportswriter Sally Jenkins wrote that thoroughbred horses had become too strong with bones too lightweight: "She ran with the heart of a locomotive, on champagne-glass ankles." Blaming the breeders and investors, Jenkins claimed, "thoroughbred racing is in a moral crisis, and everyone now knows it." PETA has called for the suspension of jockey Gabriel Saez and the prize money to be revoked if he is found at fault. Six generations back takes this horse to Native Dancer (foaled March 1950), along with all 20 of the horses in the race, and just about every horse racing in the United States today. Much opinion has been published in the press stating that there may be a connection between the fact of so much inbreeding stemming from Native Dancer, with the weak ankles seen in horses today, leading to Eight Belles' demise. The Los Angeles Times went so far as to headline its opinion piece that today's horses are being "bred for death." The owner of Eight Belles made comments and suggested solutions in an article in the Wall Street Journal. Eight Belles' dam was Away, a descendant of Northern Dancer, and her sire was Unbridled's Song. Unbridled's Song's dam is a daughter of Caro. Caro is the sire of Winning Colors, one of only three fillies to win the Kentucky Derby. Mr. Prospector and Exclusive Native were both grandsons of Native Dancer who was also the sire of Raise a Native. 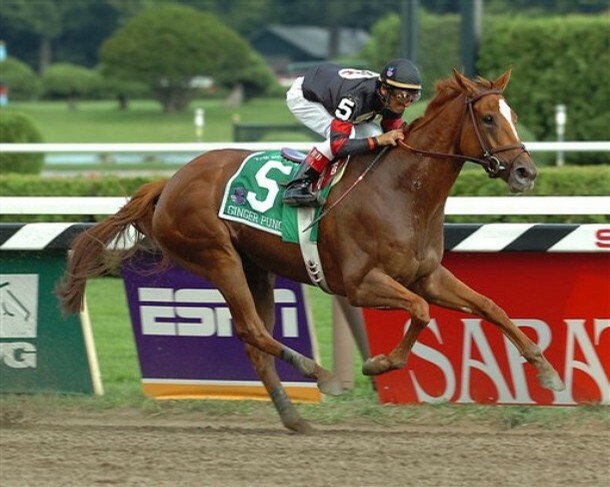 Pine Island (foaled on April 19, 2003 at Claiborne Farm in Paris, Kentucky), was an American Thoroughbred Filly Racehorse whose career and life were tragically cut short by an injury suffered during the running of the 2006 Breeders' Cup Distaff. 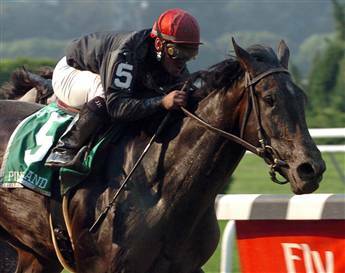 Pine Island, unraced as a two-year-old quickly displayed her promise by winning her first career start, a maiden special weight race on the turf at Gulfstream Park in Hallandale, Florida, in February 2006. Rested for almost three months after her triumphant debut, Pine Island returned to the racetrack in May, this time winning an allowance race on the main track at Belmont Park in Elmont, New York. After two strong second-place finishes in the Grade 1 Mother Goose Stakes and Coaching Club American Oaks, both at Belmont, Pine Island notched her first major score in August by winning the Grade 1 Alabama Stakes at Saratoga Race Course in Saratoga Springs, New York. She followed up this success with a win in the Grade 1 Gazelle Stakes at Belmont in September. Pine Island's promising career and ultimately her life came to an end on November 4, 2006 when she broke down on the backstrech during the running of the Breeders' Cup Distaff which was held at Churchill Downs in Louisville, Kentucky that year. It was discovered that she had dislocated her left front ankle so severely that there would be virtually no chance of her survival. Dr. Wayne McIlwraith, a track veterinarian at Churchill Downs who examined her said that there were likely multiple fractures and soft tissue injuries as well. Due to the decreased blood supply and the risk of contamination from the open wound caused by the injury, she was humanely euthanized after being vanned off the racetrack. Pine Island was buried on November 13 in a private ceremony at Claiborne Farm's Marchmont Cemetery. Claude R. "Shug" McGaughey III, who trained Pine Island for the Phipps Stable, was quoted as saying: "She was a pleasure to be around because she like doing it and she made very few mistakes like around the barn." Gus Koch, the Farm Manager of Claiborne, had this to say: "It was a sad, sad day. It was sad for the Phippses and all of us at Claiborne. We foaled her and weaned her and raised her as a yearling. She was a lovely individual to be around and very nice to get along with. It's just a tragic loss." Pine Island's grave is located right next to 1998 American Champion Three-Year-Old Filly, Banshee Breeze. Others who share the same cemetery space as her include the Phipps's racing superstar Easy Goer.